Zenit Saint Petersburg raised 1,900 comments (!) regarding Zenit Arena’s future. Meanwhile Metrostroi began work without a valid contract and taxpayers are outraged by massive relocation of public spending. 1,900 – that’s how many comments of varying importance Zenit FC raised concerning Zenit Arena. The future anchor tenant of Russia’s most expensive stadium considers 1,300 of the comments essential to establishing future cost of stadium operation. According to general director of the club Maxim Mitrofinov, Zenit is unsure about the legacy use of Zenit Arena with limited information being available to the club. While the stadium currently bears its host club’s name, it won’t be private. Zenit is to pay an annual fee of RUB 700 million for tenancy ($11 million), while not all operating costs are clear. Especially features like sliding pitch or retractable roof. The club currently estimate they could generate revenue ranging from RUB 1.5 billion to 2.5 billion annually (currently $23.5 – 39m). The upper digits would, however, only be the ideal scenario that sees vast majority of seats occupied, which isn’t entirely likely. While legally the deal between St. Petersburg Construction Committee and new contractor Metrostroi could be signed no sooner than August 17, the company entered Zenit Arena site earlier. The rush is caused by very short time to deliver the stadium, originally hoped to be done by late December. Metrostroi joined 29 subcontractors currently working on site, while previous contractor Transstroi is leaving the building. At peak employment on site is now expected to reach 3,000 people. 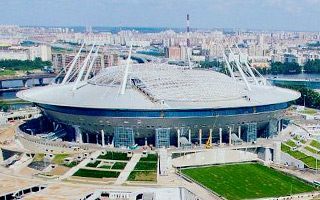 In recent days the Construction Committee decided to shift RUB 2.6 billion from social spending to the delivery of Zenit Arena (1.7 billion) and surrounding infrastructure (900 million). The funds were supposed to be spent on school, kindergarten and hospital improvements, which explains the uproar. An online petition was even created, appealing to Gazprom to cover the missing amount.